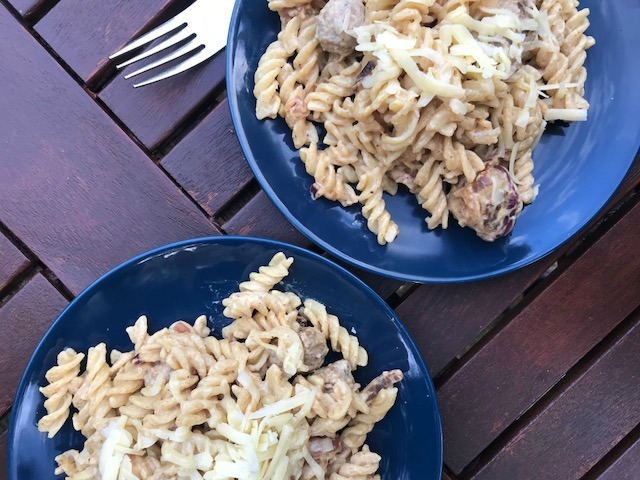 If you regularly read my meal plans you will see that creamy mustard and sausage pasta come up regularly. It often appears on my weekly meal plan for 2 good reasons. One it tastes really good and secondly it is easily adapted for the boys. All I do is split the sausages and pasta in two and their “sauce” is creme fraiche and cheese. If you are looking for a simple and tasty meal to make quickly after work then this is just the thing. This recipe will serve 6 people. Measure out the dried pasta and cook until al dente. Finely slice the red onions. take the sausage meat out of the cases in little balls and fry with the onions. When cooked, drain the pasta and then add to the cooked sausage and onion. Stir in the creme fraiche and Dijon and wholegrain mustard. Serve the pasta and top with cheese. Labels: Creamy Mustard And Sausage Pasta, recipe. This is my kind of pasta. I love using creme fraiche instead of cream or a sauce it's so quick and easy too. I love how simple this meal is and how you can adapt it for those who don't want too much mustard. It would be absolutely perfect for an easy midweek meal! I cant remember the last time I used sausages in a pasta dish. I did use too and they were fab. Thanks for reminding me with this fabulous recipe Definitely one to try. 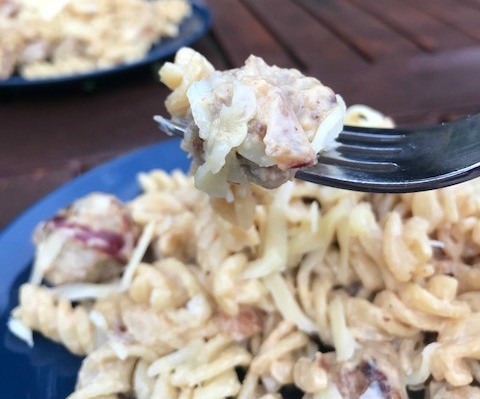 But sausage and pasta—already yum. Add in mustard? I've never tried this (except in very small amounts as an accent in the background), but it sounds fabulous!